Sunshine and warm weather is forecast for this Memorial Day Weekend and it should be a wonderful time to get out and go fishing. 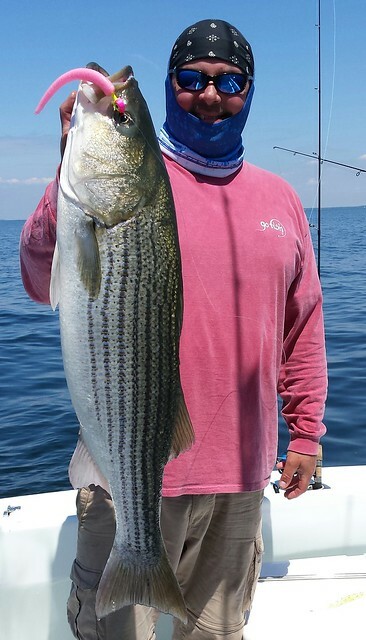 The striped bass fishing on the Chesapeake could hardly be better, and the surf and offshore fishing at Ocean City is also outstanding. Freshwater lakes and ponds will be inviting young and old to enjoy some quiet time fishing for a variety of fish species. For some a modest Memorial Day crab feast may not be out of the question with recreational crabbing being good on the lower Eastern Shore counties. At the Susquehanna Flats area, there continues to be good light tackle fishing for striped bass in the mornings with topwater lures. Water temperatures are about 65° and will certainly warm up this week with sun and warm weather in the forecast so early morning or late evening fishing will offer the best opportunities. In the Susquehanna River there are a lot of white perch to be found with the bulk of them being in the 6" size range. Small jigs, shad darts or bottom rigs baited with a piece of bloodworm are all that is needed to entice them to bite. 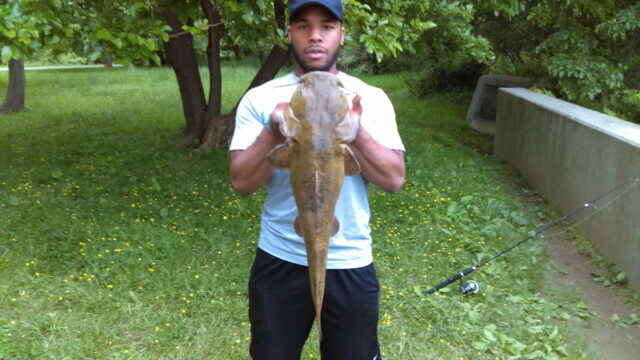 Large flathead catfish can be found in the dam pool and it takes very stout tackle to wrestle them out of the heavy current. Heavy jig heads with a large piece of fresh cut bait is the ticket to this party. The water release schedule at the dam has been variable with a morning and late afternoon releases more often than not. This nice flathead will make for some fine eating. In the upper bay region striped bass are being found along channel edges near the entrance to Baltimore Harbor, Love Point, Baltimore Light and Sandy Point Light. Trolling medium- sized tandem bucktails behind planers or umbrella rigs behind inline weights has been popular as well as chumming. The best chumming has been reported to be on a falling tide. The Bay Bridge piers always hold striped bass and some are chumming and chunking up current of the piers or jigging close to the bridge pier bases with bucktails and soft plastic jigs. There has been good chumming action at Hackett's bar recently and boats have been anchoring up near the Green Can on the 35' edge and farther out towards the shipping channel 40' to 45' edge. The best action is reported to be on a falling tide. Schools of bay anchovies are arriving in the middle bay region and striped bass strongly represented by the 2011 year class are working them over. Water temperatures in the middle bay region are about 61° today and should start to rise with warmer weather and sunshine this week. Those that were able to go fishing this past Friday enjoyed some epic action that many will not forget anytime soon. There were schools of striped bass in the 20" to 36" size range spread all along the western edge of the shipping channel feeding on bait that was being swept along by stiff currents. Brown pelicans and sea gulls could be seen getting in on the action as bait was pushed to the surface. Rich Watts was one of the lucky ones who got out on one of the few sunny days we've seen in a while. As much as Rich fishes he sent in this report full of excitement. My friend Leo Kuneman and I ran into a huge pack of birds and brown pelicans diving on Friday near the western edge of the shipping channel below Breezy Point. It was gorgeous out and we were all alone on the western channel edge in about 40 ft water; we jigged up easy 100 fish!!!! Seriously! All were over 20 inches with the best 2 being 35 and 38 inchers! I caught them both on my light spinning gear with 20lb braid and pink and green bass assassins. Man it was great; I have never seen so many rockfish!! Each hooked fish was being followed by a wolf pack of like 10-20 fish!!! I had some other friends who decided to fish the shallows near the mouth of the Choptank River with topwater poppers late Friday and I received the same kind of excited fishing report Friday night. The water was reported to be extremely clear and the striped bass from 20" up to over 30" were abundant in the shallows and could be seen coming towards the lures before they struck. 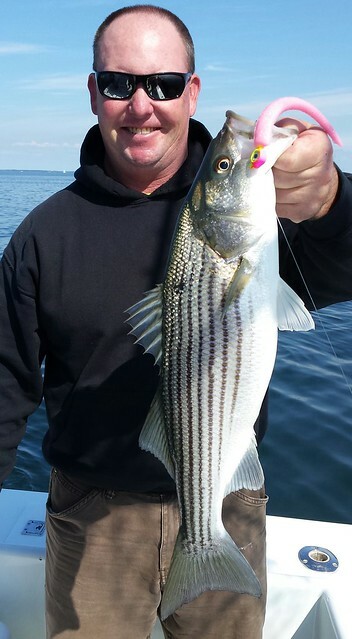 It sure sounds like these are some happy times for striped bass fishing, so now is the time to get out on the bay and get into your own exciting action. Make sure your line is in good order and replace mono and braid to make sure you don't lose the big one, for we all know it is the largest fish that always gets away. New fluorocarbon leaders, junction knots, snaps and swivels should all be checked for wear. Some of the better middle bay spots to check for striped bass holding along channel edges are often the Gum Thickets, Buoy 83, the Hill, Thomas Point, Holland Point, the Clay Banks and the western edge of the shipping channel from Holland Point south to the Calvert Cliffs Power Plant. The bay and tidal rivers have miles of shorelines and shallow water fishing areas such as Thomas Point, along the Poplar Island shores, the lower Choptank and Dorchester County shorelines or your personal favorite spots offer some fun fishing. A variety of soft plastic jigs tend to work the best this time of the year along the channel edges and deeper waters and when fishing the shallows it is hard to beat poppers such as the Chug a Bug or the Smack-it Jr. If you have a notion to break out the fly fishing stuff, skipping bugs will keep you entertained to no end. As the end of May approaches the thought of black drum fishing on some of the shoal areas in the middle and lower bay will have fishermen thinking about dunking soft crab baits. Locations such as the Sharps Island Flats, the James Island Flats and the Mud Leads above the Target Ship are three of the traditional locations to slowly inspect with depth finders. 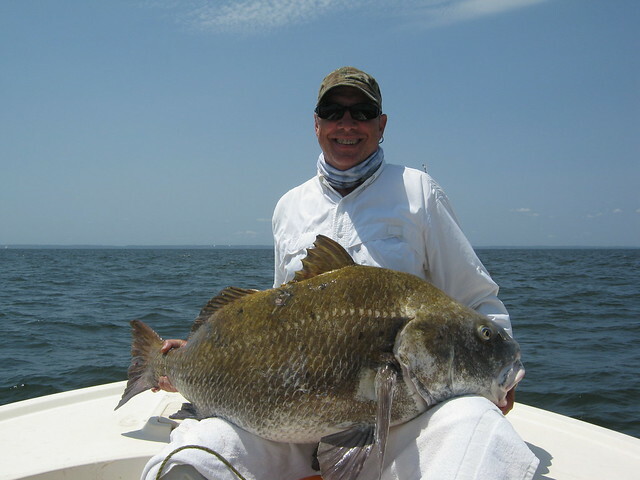 Black drum show up on a depth finder like a Virginia Class Attack Submarine because of their large air bladders. Stout tackle, half a soft crab held on a hook with rubber bands is the ticket to this event and baits are dropped when marks are called out. The lower bay region has plenty of striped bass action this week. A few die-hards are still pulling a few large lures in their trolling spreads but smaller medium sized offerings are much more popular now. A variety of bucktails and spoons are common as are umbrella rigs and swim shad type lures. The channel edges in about 35' of water have been popular places to troll around Cove Point, the HS Buoy, Buoy 72, the Middle Grounds and the channel edges in the lower Potomac neat St. Georges Island and Piney Point. When concentrations of fish can be found either under birds or on depth finders light tackle jigging offers a fun way to catch one's striped bass on soft plastic jigs. Shallow water fishing for striped bass is expanding this week all along the marsh edges on the eastern side of the lower bay and a few speckled trout have also been caught. Most are casting topwater poppers over shallow grass, near structure while others cast swim shads or suspended jerkbaits. Those looking for the first speckled trout of the season will be casting white Gulp Mullet lures or drifting soft or peeler crab in some of the creek mouths along the bay marsh edges. On the western side of the lower bay region places like the old Cedar Point Light rocks, the shorelines of the lower Patuxent and Potomac are excellent places to cast topwater poppers or other favorite lures in the early morning or evening hours. The white perch continue to move into their traditional summer time habitat haunts this week and with warm sunny weather in the extended forecast that movement will accelerate as water temperatures rise. At the moment, depths as shallow as 10" hold possibilities for catching white perch in the tidal rivers and creeks within the lower bay region. Croakers are becoming more common with rising water temperatures and the mouth of the Wicomico River off the lower Potomac has been one of the best places to fish for them. Medium-sized blue catfish are very abundant in the area and certainly help round out a day's catch. Recreational crabbers continue to enjoy good crabbing on the lower Eastern Shore tidal rivers and creeks. The action starts at the Choptank River but really becomes good from the Little Choptank and south to the Pocomoke River. The legal size crabs are heavy and approaching their first shed so they make for some fine eating. Deep Creek Lake has undergone a bit of a chill in the past week but warmer weather and bright sun will warm up waters, especially the shallower cove areas quickly. The largemouth bass were reported to have backed off last week and the action was very slow; this situation should improve over the weekend. 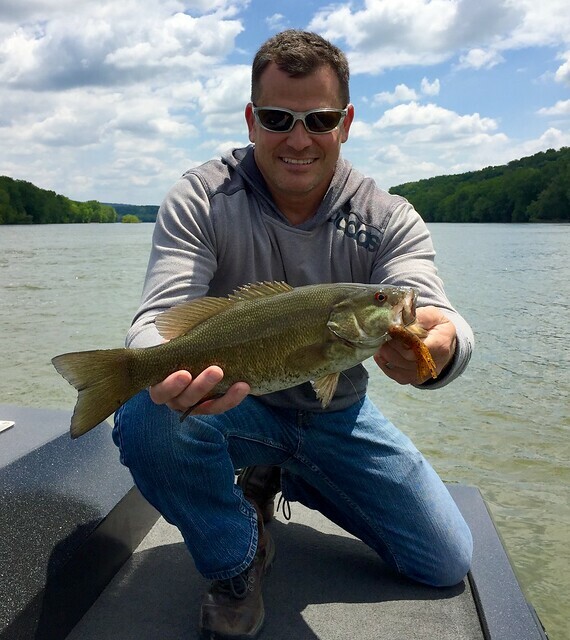 Smallmouth bass fishing has been very good, everyone reports a lot of action with bass in the 14" size range on tubes, stick worms and suspended jerkbaits near rocky shores and floating docks. Drifting along deep grass edges and casting small lures or fishing with live minnows will get you into a mix of large yellow perch, walleye, smallmouth bass, chain pickerel and the occasional rainbow trout. There is plenty of action in the coves for chain pickerel and northern pike. Deep Creek Lake will of course see a dramatic change in boat traffic beginning this weekend so be careful out there when fishing in a small boat. The upper Potomac River is reported to be dangerous for anyone but the most experienced so caution is advised and anyone thinking about fishing on the river should check local conditions. Water temperatures are reported to be about 62°, there is some smallmouth bass action on tubes and jigs. Tony Prochaska holds up a nice smallmouth bass before releasing it back into the river. The spring stocking of trout in the put and take areas is winding down in most areas except the two western most counties due to warming water temperatures. A portion of the western region trout waters are managed for recreational catch and release use and have designations such as no keep, fly fishing only or artificial lures only. They offer trout fishermen the option of enjoying summertime trout action in beautiful settings. This happy trout fisherman will not soon forget this huge trophy trout that was raised and stocked in a put and take area by the trout program. Largemouth bass in most areas of Maryland except the far western region waters are now in a post-spawn mode of activity and in the mood to actively feed and build up their strength. Largemouth bass can still be found in the shallows with topwater lures but most knowledgeable bass fishermen are now targeting grass and sunken wood. Stick worms, tubes and jigs have been a favorite when targeting structure and spinnerbaits and suspended jerkbaits are being used to cover expanses of water. When fishing tidal waters working the edges of grass and spatterdock at low tide can be a good choice. There has been plenty of excitement on the Ocean City surf fishing scene this week. The action along the beaches could hardly be better. The best opportunities now exist for catching large striped bass in the surf as these big fish pass by Maryland shores on their way to New England waters. Most are fishing with heavy tackle and using fresh cut menhaden or sand fleas for bait. There are some black drum being caught also on these baits along with large bluefish. There are also smaller bluefish in the surf and finger mullet is the bait of choice for targeting the smaller bluefish. There are reports of the season's first kingfish being caught on bloodworms. Surf water temperature is about 60°. 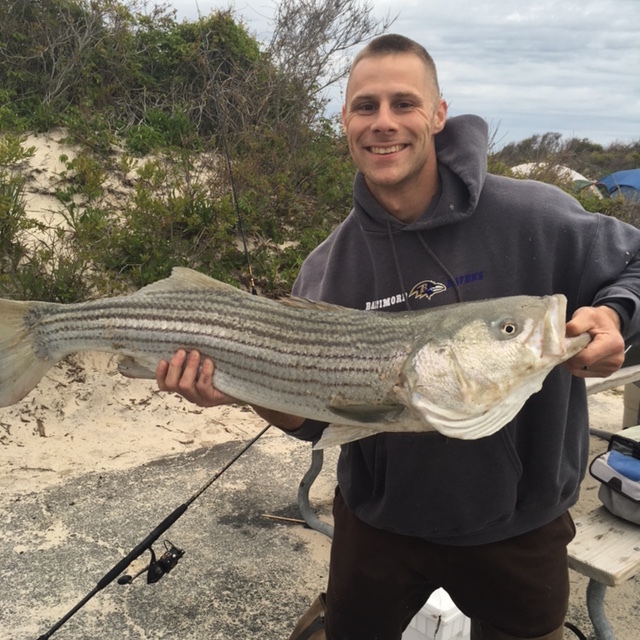 This happy surf caster is certainly got a lot to smile about with this fine striped bass. Large and smaller bluefish are moving in and out of the inlet. Casting spec rigs and Got-Cha plugs has been the most popular way to catch them. Striped bass are also part of the mix. Tautog continue to be caught near bulkheads and jetty rocks on pieces of crab or sand fleas. Flounder action at the inlet area and back bays has been slow and most likely can be attributed to early season cool water and cloudy water conditions. Outside the inlet there are large bluefish being caught on the shoal areas along with a large striped bass now and then. Most are either trolling or jigging when fish can be detected on depth finders and when bluefish seem to be absent; drifting live eels is a very good way to catch one of the large striped bass moving through the region. Farther offshore sea bass fishing has been very good on many of the reef and wreck sites with limit catches being common. A few boats have been making the run out beyond the canyon in search of temperature breaks. When they do find water in the 60's the often find themselves east of the Poorman's and Baltimore Canyons. Yellowfin tuna in the 35 lb to 45 lb size range and a few dolphin have been their reward.